I have the good fortune to belong to a small group of seasoned Cleveland writers who occasionally gather for lunch at irregular intervals. Cuyahoga County Treasurer Jim Rokakis, everyone's favorite earnest local pol, happened to join us for our last session. As I was sipping my soup, he startled us (or maybe just me) a bit with this surprising tidbit, an outcome of both the online auction revolution and Cleveland's home foreclosure crisis. "I get emails all the time: 'I just bought my house on Ebay. Can you tell me what my taxes will be?'" Last year, I noted this op-ed on the region's foreclosure crisis that Jim wrote for the Washington Post. He's also been active on the issue of trying to force wealthy nonprofits to ante up their fair share of the tax burden, as I noted here. 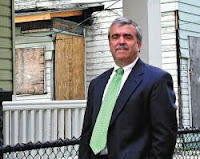 Next week, Jim will be addressing the foreclosure crisis at the City Club. I expect to be there, and hope to see a few of you as well. Treasurer Rokakis continues to do an incredible job of providing programs and services that benefit the residents of our county. As mortars continue to explode in the political mine field, it is reassuring to know that there are exemplary officeholders like Jim that truly believe in the term "public service". That's a doubly valuable hosanna, coming from someone who's as deeply enmeshed in this issue every day as he has been. I hope readers will spend some time checking out the group that Lou Tisler leads, NHS (link below).